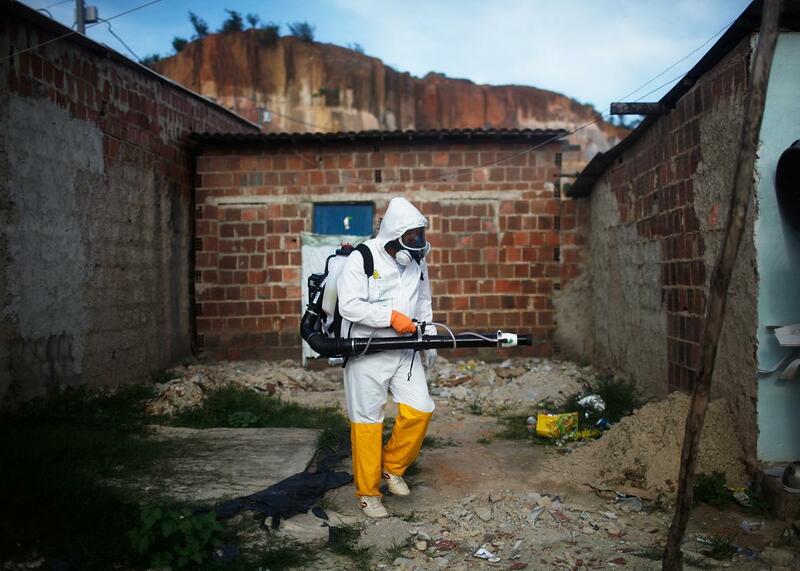 A city worker fumigates in an effort to eradicate the mosquito which transmits the Zika virus, Feb. 4, 2016, in Recife, Pernambuco state, Brazil—near the epicenter of the crisis. On Tuesday, Feb. 23, Future Tense will hold an event in Washington, D.C., on using genetic engineering to stop Zika. For more information and to RSVP, visit the New America website. The money is pouring in for efforts to fight Zika and mitigate its effect. On Thursday, the World Bank announced $150 million in Zika-related aid to the hardest hit countries in Latin America and the Caribbean, where the economic impact in tourism-dependent regions is expected to top $3.5 billion. (The U.S. Centers for Disease Control has issued a rare travel warning for pregnant women thinking of visiting Zika-affected regions out of an abundance of caution.) The World Health Organization, which has declared a “public health emergency of international concern” for Zika, announced a lengthy coordinated response plan on Tuesday that provides an additional $56 million in funding for efforts to stem the spread of the disease, including the search for a vaccine. President Obama’s $1.8 billion in Zika-related funding is currently being debated in Congress. As the disease spreads, it’s prompted an “all hands on deck” mentality from virus experts in academia, government, and private industry—perhaps the clearest example yet of 21st century, just-in-time scientific discovery. Leading the charge is Anthony Fauci, the head of the National Institute of Allergy and Infectious Diseases at the National Institutes of Health. I spoke with him earlier this month, a few days after he briefed Obama on the latest efforts to characterize the disease. Fauci is quickly summed up his mentality when it comes to Zika: “This is an issue, we’re going to address it, we’re going to be prepared for it, and that’s it,” he told me. “I just told our people in our vaccine research center to start converting on to a Zika platform as opposed to what they’re doing, and they’re doing it.” Like many other experts, he expects person-to-person transmission of Zika to arrive in the United States this summer, though the extent to which it will spread in the U.S. is still uncertain. In his role, Fauci can fund and marshal top experts in universities to search for likely cures, but he still needs support from the pharmaceutical industry. At least a dozen companies are already working on a Zika vaccine, and the prospect of so many parallel research programs means a prototype vaccine may be available in just a few months, with initial phase 1 clinical trials beginning in humans by the end of the year. “The worse the outbreak, the less time it takes to prove whether it’s effective and safe,” Fauci said. 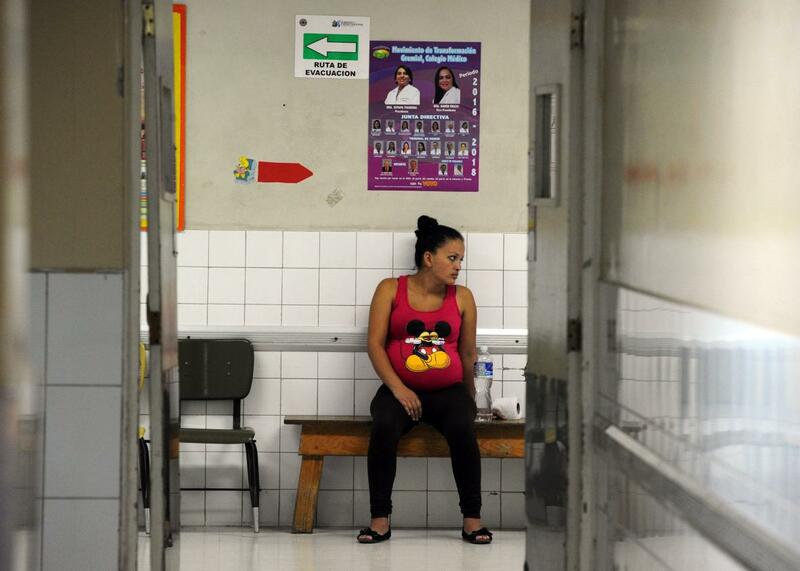 A pregnant woman waits to be attended at the Maternal and Children’s Hospital in Tegucigalpa, Honduras, Jan. 21, 2016. It’s rare that so many companies are working on an emerging disease during the initial outbreak phase, because it’s difficult to predict the ultimate demand for the vaccine. That’s why government support at this stage is critical. And even with that support, according to virologists I spoke with, Zika poses unique challenges to vaccine development—namely that the population that seems to be most at risk is pregnant women. Over the last few days, researchers in South America have made firmer, albeit still tentative, connections between Zika and its two major threats: increased risk of microcephaly and Guillain-Barré syndrome, a type of degenerative condition of the nervous system in adults. There’s concern that a prospective vaccine may increase the risk of Guillain-Barré if it too closely mimics the virus. ” ‘Do no harm’ is always a mantra when it comes to vaccinology,” said Michael Diamond, head of the Infectious Diseases and Vaccine Development Center at Washington University in St. Louis. “Since one of the key populations is pregnant women, vaccine developers will probably need to spend extra time to make absolutely sure the prospective vaccine is safe.” Diamond also said he’d been contacted directly by the NIH to inquire about his Zika research, a rare step. One company working on Zika is NewLink Genetics. Their chief scientist, Tom Monath, helped develop the precursor to a dengue vaccine (a tropical disease in the same family as Zika) as well as a genetically engineered Ebola vaccine. Before joining private industry, Monath was the director of the vector-borne disease division at the Centers for Disease Control and Prevention as well as chief of the virology division at U.S. Army Medical Research Institute of Infectious Diseases, which was featured in the Ebola-themed nonfiction book The Hot Zone. 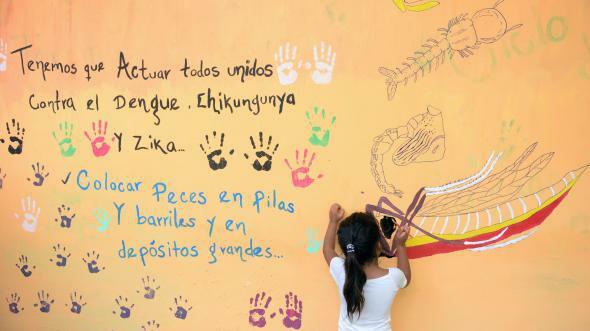 A girl paints a mural that educates people about a mosquito control project in the village of San Diego, in La Libertad, El Salvador, Feb. 4, 2016.